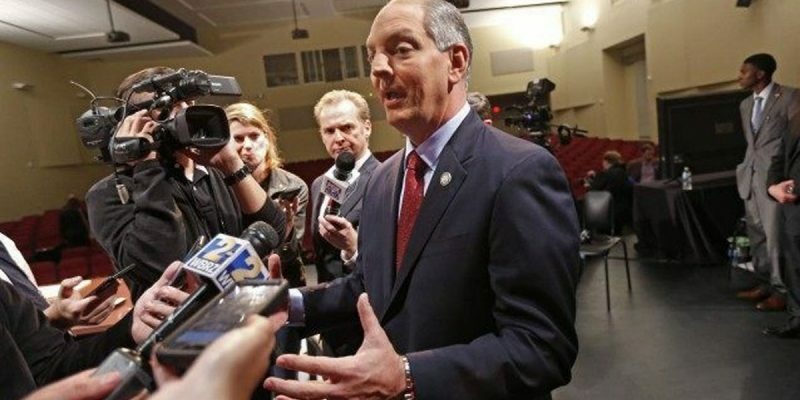 How Pro-Life Is John Bel Edwards, Really? We had a very telling – and utterly predictable – response from Louisiana Gov. John Bel Edwards’ people to our post on Edwards and his reaction to Virginia Gov. Ralph Northam’s troubles yesterday. When we posted our piece, we did so without reference to Edwards’ statement Sunday that if Northam really was in that picture from his medical school yearbook wearing blackface and standing next to someone else posing as a Klansman he ought to resign. The result was what we knew would come – namely, that everyone would notice John Bel Edwards had nothing to say about Ralph Northam’s far worse sin. That being his comments on a since-killed bill in the Virginia legislature which would have made abortion legal up to birth. This is a really big deal, by the way. If you’re truly pro-life, Northam’s comments, which casually discuss what can only be considered murder of newborn babies, are so abhorrent as to make you apoplectic. And coming on the heels of the abomination in New York, where a Democrat legislature passed and a Democrat governor signed a bill with a very similar effect to the one Northam was touting in Virginia, this is an issue which has the pro-life community (1) on edge and (2) looking for a way to stop these lurches toward legalized infanticide in their tracks. John Bel Edwards says he’s part of the pro-life community. So when Northam uncorked his monstrous talk about doctors and mothers colluding to murder newborns, he should have been outspoken in opposition. He wasn’t, of course. He was silent. And as we noted yesterday, part of the reason was that his donors had helped to bankroll Northam in 2017 and in return last year Northam threw Edwards a fundraiser and raised him more than $100,000. But when Northam got caught having taken a picture in blackface that appeared in his medical school yearbook – and by the way that photo came to light, we’re told by the folks at Big League Politics who broke the story, because one of his classmates was appalled at his infanticide comments and decided to out him for the blackface as a result – Edwards then grew indignant and suggested he resign “if” it was Northam in the photo. But not for discussing the slaughter of newborns – not 35 years ago but last week when commenting on public policy. We’re no defenders of blackface. We take great pride in having played a part in trashing Robbie Gatti’s campaign for the Louisiana House of Representatives by publicizing Gatti’s photograph in blackface. But between a stupid prank decades ago and a monstrous statement about killing newborns last week, there is no comparison which paints Northam in a more unacceptable light. What Johnson is referencing about Edwards’ executive appointment is the fact that the Louisiana Department of Health is run by Dr. Rebekah Gee, whose history is pretty clearly on the pro-abortion side of the equation. We thought it was instructive that the Twitter thread which followed behind the link to our post yesterday was full of Edwards’ surrogates throwing a fit over the statement Edwards was silent about Northam. All of those Edwards backers jumped on the blackface issue – none had the slightest thing to say about the infanticide issue. Everybody is aware that Edwards claims to be pro-life, of course, and that claim goes largely unchallenged by Louisiana’s legacy media. And yet Louisiana is enmeshed right now in a massive, potentially historic abortion case which is likely headed soon for the U.S. Supreme Court. That case, June Medical Services v. Gee, involves the state’s law passed in 2014 which requires abortion doctors to have admitting privileges at nearby hospitals. The law was challenged on the basis that it creates an undue burden on women seeking abortions, a challenge identical to one which was successful when the Supreme Court struck down a similar Texas law in 2016 on a 5-3 vote. But the Supreme Court has a bit different composition this time – while Justice Antonin Scalia’s seat was vacant then following his death, that seat is now filled by Neil Gorsuch who might well be expected to be a fourth vote upholding an admitting-privileges law. And with Brett Kavanaugh now on the Supreme Court instead of Anthony Kennedy, it’s entirely possible the Louisiana statute will survive and change the abortion debate altogether. It’s a very big deal. And while the Louisiana law lost in court at the district level in 2017, last year the Fifth Circuit reversed the lower court and upheld it. Because of that ruling it was supposed to finally go into effect Monday but on Friday Supreme Court Justice Samuel Alito, who voted to uphold the similar Texas law and will likely vote to uphold the Louisiana statute, issued an order staying the effect of the law until Thursday. This week we’re likely to see some serious fireworks on the issue. All of which leads us to something obvious – which is that if John Bel Edwards is pro-life, and the Planned Parenthood crowd is screaming about that statute possibly shutting down every abortion clinic in Louisiana save one, you’d think Edwards would be enthusiastically backing efforts to get that law upheld. The Louisiana Department of Health, which is essentially the defendant in the case, soaks up half Louisiana’s state budget. And yet, LDH isn’t spending a dime defending the admitting-privileges bill or in the other abortion cases the state is busy fighting – with legal fees mounting over a million dollars. That bill is being footed by the Attorney General’s office, whose budget Edwards doesn’t control. Edwards, has, however, repeatedly gutted that agency’s funding in his executive budgets since taking office. Which is peculiar, particularly when Edwards makes statements like the one he made back in June of last year that the case is “worth fighting.” Really? Then why does one of the least well-funded agencies in Louisiana’s entire government have to cover the cost? It starts to become a little suspicious. Especially when “pro-life” John Bel Edwards isn’t even upset about Northam’s monstrous infanticide comments. One gets the impression he expects to be given deference on this issue, as though claiming to be pro-life will suffice and actually doing something to further pro-life policy goals isn’t required. Let’s remember Edwards also claimed to be opposed to tax increases, too. That wasn’t a promise which aged too well. 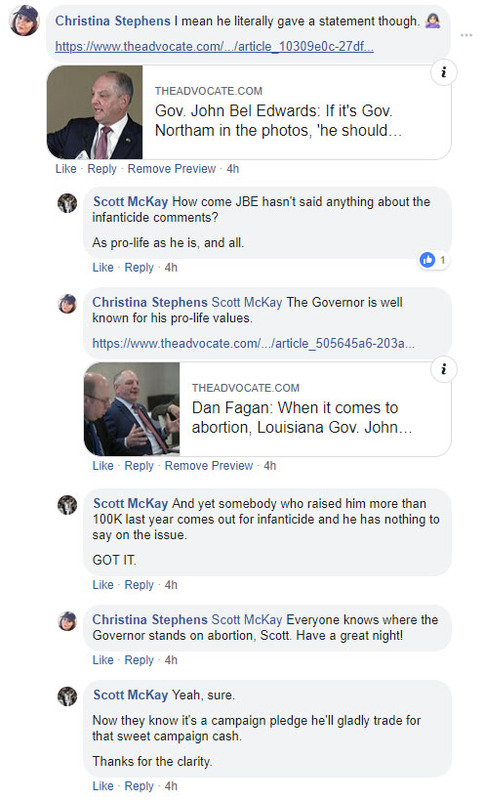 The real pro-life people in Louisiana, the ones who follow the issue closely, are far less than impressed with Edwards’ performance on the abortion battlefront. He gave a pretty good clue of his bona fides with his silence on Northam last week, and his defenders didn’t help his cause by assuming Edwards could escape accountability by denouncing Northam over the blackface photo. Now we know Edwards’ pro-life stance is as hollow as his record.